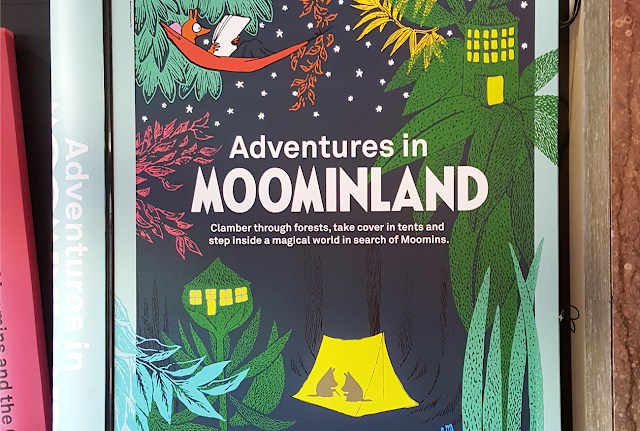 I had the enormous pleasure of visiting 'Adventures in Moominland' at the Southbank Centre yesterday, it was superb! This is like no other exhibition I have been to, it was a completely immersive experience and just amazing to visit, so much fun! I was, quite rightly, unable to take any pictures, and actually nor do I want to describe too much detail and ruin the surprises! What I can tell you is that the picture above may look like a book on a shelf, but is in fact the entrance to the exhibition. The giant book opened up and we were led into a magical world by our engaging and energetic guide who took us on the journey, offering insights into Tove Jansson's life and practices and supporting a greater understanding of her inspirational work. 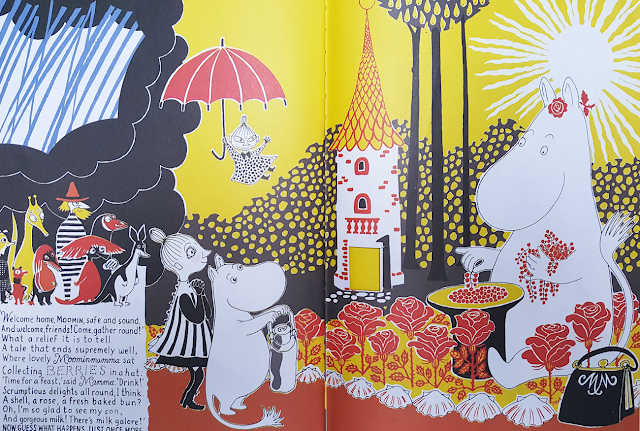 Huge attention to detail has been paid to the set design, to ensure the entire experience is authentic to the imagination and creativity of Tove Jansson and the wonderful worlds she created. There are lots of original artefacts and artworks, on loan from the Moomin Museum in Finland and they are lovingly displayed and also hidden. Go and see what I mean for yourself! I really loved seeing her paints and tools, and original drawings alongside other personal items in these fantastic rooms. Such an excellent installation, it must have been an absolute joy to be involved in researching and making. In addition to the overall participatory fun and visual delights, our tour guide was engaging, friendly and informal and I learned so much about Tove's life and personality, and how this informed her creations. I admit I'm not usually a fan of guided tours per se but this is very different, and really supports the surrounding and the work, rather than distracting from it. We were encouraged to explore the rooms ourselves while she was talking, and there were many surprises along the way! 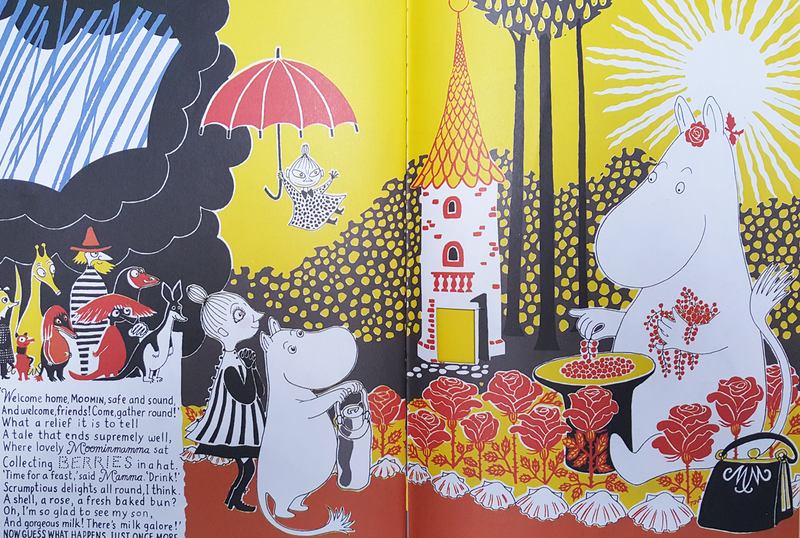 Before my visit I was already a dedicated moomin fan, and adore reading the stories to my toddler in bed at night. I am obviously drawn to the beautiful graphic illustrations, superb bold colour palettes and clean lines; but the integrity of the stories, morals and the characters is equally as appealing to me. The show is recommended for ages 7+, however I took my bold nearly 4 year old and she absolutely loved it. Use your own discretion, if your child is likely to be phased by the dark or a loud noise, it might not be for them. The guide can take you out if you need to leave, but you won't be able to go back in, so consider this carefully! They have recently extended the run until August, and you must buy a ticket in advance. I thoroughly recommend this exhibition. 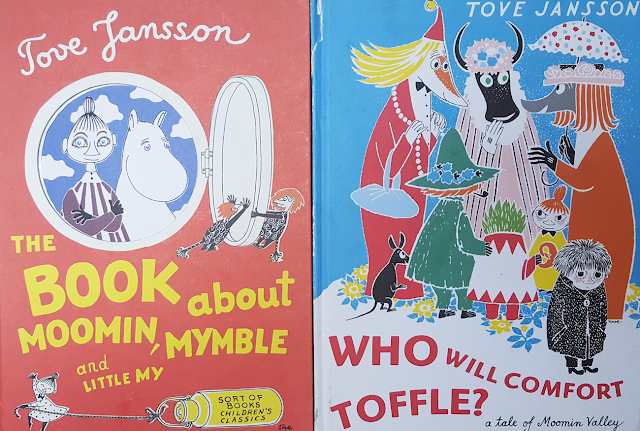 I didn't think I could be more in love with the moomins and Tove's illustrations, and then I went to this and was even more amazed! There is also a cute pop up Moomin shop in the foyer, and of course we had to visit the glass lift in the corner. If you don't know what I'm talking about, just go and see it for yourself, its cool. The Southbank is such an excellent area, my favourite part of London and its really family friendly. There is so much to see, and its so creative and alive with art and dance and performance everywhere you turn. I love that just by standing on the spot at Southbank you can look out across the Thames, see boats, trains, buses, amazing old and new architecture, Big Ben, loads of landmarks, the London Eye, bridges, birds, skateboarders and more! Its a real hub of activity, and there is so much to absorb for free. This post was feeling a bit text heavy and lacking in some nice visuals so seeing as I couldn't show any pictures from the exhibition, here's our favourite well-loved books below. Thanks for reading, and I hope you can get there yourself soon. London is my favorite place and i wish i could spent my whole vacations their with my family but i am very happy after reading your blog because it reminds me about my days in London.